During the past year, a group of extremist Muslims and secular Arab fanatics have launched a campaign of hatred targeting my efforts, lobbying Arab American and Muslim groups to not book my comedy act because I appeared with an “Israeli” comedian as a part of the “Israeli-Palestinian Comedy Tour and also because I advocate for peace between Israelis and Palestinians based on land-for-peace compromise and, more importantly, a rejection of violence. I reject violence and believe that Palestinians, Arabs and Muslims must do more to speak out against the violence and fanaticism that infects our community. Ray Hanania Arab-Israeli-Jewish Comedy Show 2008 fromRay Hanania on Vimeo. 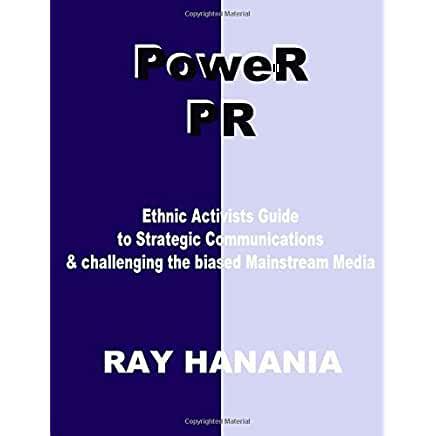 Hanania received the 2006 Best Ethnic Columnist Award from the New America Media for columns he wrote for YnetNews.com. This is an interview on UpFront Radio discusses the columns and the focus on the commonality of Arabs and Israelis, Jews and Palestinians. Audio only. 12 minutes in length. Broadcast in November 2006. The Winnipeg Comedy Festival (2008) (www.WinnipegComedyFestival.com), the Chicago Comedy Festival (2002). American friends of SHALVA (NY), Amnesty International (Dublin, Ireland), Houston World Affair’s Council, KAM Isaiah Israel Synagogue, B’nai Yehuda Beth Shalom Synagogue, LIMUD LA, , B’nai Brith College Campuses/Hillel College Campuses hosted by MASA-Israel Journeys; Israeli-Palestinian Comedy Tour at Spertus Jewish College (400 people); IPCT at Roy Thomson Hall in Toronto, Canada (1,500 people); IPCT at Off-the-Wall Comedy Club in West Jerusalem; Ray Hanania at the Global Peace & Unity Conference in London; Israeli-Palestinian Comedy Tour (Haifa, Beershba, Tel Aviv, Ra’anana, West Jerusalem, East Jerusalem, Anglican School, Seeds of Peace, New Israel Fund, Ambassador East Hotel); Second City (Heeb Magazine), Northwest Indiana Islamic Center, Purdue University, American University of Beirut Alumni Association, Society of Professional Journalists 2006 Convention, American University of Dubai, USA; Northeastern University, Boston; Hillel/Arab Student Org, Emory College, Atlanta; Duke University/Friends of Israel/Freeman Center, Raleigh-Durham, NC; Illinois Institute of Technology, Chicago; US Consulate, Jerusalem; PYALARA, Palestine; Truman College, Kirksville; Taste of Chicago 2004; Brandeis University; Marquette University; Loyola University; DePaul University; Northwestern University; Oregon Library Association; Northwestern Christian College; University of Missouri, KC; Zanies Comedy Clubs (Chicago & St. Charles); Riddles Comedy Club, Orland Park; The Chicago ComedyFest; Barrel of Laughs; Caroline’s on Broadway, New York; The New York Comedy Club; The Comedy Spot; ASACA/ADC Detroit; Wayne State University; Seattle Arab Festival; Milwaukee Arab Festival; Dallas Film Festival; Americans for Peace Now (Hudson Theater); Seeds of Peace (Detroit); The University of Michigan; Cleveland AACCESS; Arab Community Center of Knoxville; National Society of Newspaper Columnists (Tucson); The University of Illinois YMCA Champaign; al-Khayam Show Lounge “Everyone Loves Abdullah” Chicago; the first-ever Arab ComedyFest in New York Nov. 2002. Atlanta Jewish Times Feb. 26, 2004 — Read it? Ray Hanania’s Arab-Jewish comedy act is intended to promote peace and understanding through humor, stand-up comedy and political and social satire. One Man Show: A humorous introduction that puts the audience into the context of the Post-Sept. 11 world and the power of humor; 60 minutes of stand-up comedy and humor; concluding humor essay. Though I am Orthodox Christian (one of the few Palestinian Christian professional comedians, humorists and writers in the country) I also speak to the issues facing Muslims in America, mainly because we share the same stereotype and experience. Most Americans view me and other “Arabs” — regardless of their religion — as Muslim, an error on their part that I am very proud to defend. Though I am a Christian, I am Muslim by culture. As a Palestinian peace activist, I also use humor to help Palestinian, Jewish, Arab and Israeli audiences recognize the humanity that exists behind the tragic headlines we face in the Middle East conflict. My wife and son are Jewish and I understand the Jewish faith. Ray Hanania’s comedy is based in a history of professional humor writing, beginning with his columns in the Chicago Sun-Times lampooning his experiences through airport security in the 1980s and 1990s, and his humor book, I’m Glad I Look Like a Terrorist: Growing Up Arab in America. They also include humor columns written for publications like Newsweek Magazine (Nov. 1998) and the more. As the events of the Middle East continue to spiral into worsening bloodshed and violence, and in the aftermath of the September 11, 2001 terrorist attacks and destruction of the World Trade Center’s Twin Towers, we all need to take a break. It’s not that we have to pretend the violence isn’t taking place. But we need to counter the tragedy. We also need to find new ways to break through the divisions that separate Arabs and Jews. The best way to do that is through humor. And, I’ve decided to turn to humor both as a self-healing medium to ease the personal trauma, but also as a way to soften the hatred that is consuming some in the American public. My stand-up comedy routine doesn’t cross the line and I don’t make fun of religion. But, we Arab Americans need to soften our own image for Americans. We can’t expect them to shoulder the burden to better understand us. We have to do our part. And nothing is more effective in reaching the hearts and minds of Americans than humor.Many of the jokes address stereotypes that already exist about Arab Americans. For example, I jest about Berqas (complete head-to-toe clothing covering for women) and also Honor Killings, a practice common in many countries including the Arab World. I ridicule these because they are wrong and are not sacred.The humor is intended to soften that view, to take the edge off of the hatred as a means of breaking down hatred, negative stereotypes, misunderstanding, but more importantly, to show the American people that we, Arab Americans, have a sense of humor. We are not fanatics who live for murder and killing, but people who are like you and me. We are no different.I HAVE TWO ROLE MODELS:One of my role models is Jerry Seinfeld, who is a Jewish-Arab comedian. His mother is from a Jewish family from Damascus, Syria and grew up in the Syrian Jewish community in Bensonhurst section of Brooklyn. After the tragedy of September 11th, 2001, Seinfeld did several comedy appearances to help raise nearly $1.9 million for Mayor Guiliani’s Twin Tower’s Fund. In his biography, Seinfeld notes “It (comedy) identifies us as Americans … what I would call classic American behavior, an act of defiance and a way of striking back. Ironic humor … people coming back with a vengeance, returning to our lives with great glee.” Additionally, Seinfeld flopped on his first stand-up .. but went on to great things … another comedian I admire is David Brenner who I once interviewed as a reporter writing the celebrity column for the Chicago Sun-Times “Page 10.”My second role is Danny Thomas. As a child, I remember our family scheduling a gathering in front of the TV to watch Danny Thomas, the only Arab American on television in the 50s and 60s. He was a tremendous role model. His humor was clean, funny and despite being restricted by the times, he still managed to inject Arab American issues. The character of his Uncle Tannous always prompted a healthy laugh.All my jokes are original, written by me. They are delivered respectfully, but without inhibition. The jokes I say in jest are now said in anger and are harmful in a far greater way than the humor I offer. I figure, maybe if an American sees me laughing at a stereotype about Arabs, they might laugh too, and the stereotype might not be as important to them as it was. If I laugh about it, why not them too?I will update this page regularly with information on dates and locations for my stand-up comedy performances, and will also post related articles and columns for your enjoyment.Humor, by itself, is not the answer. But, it can make a difference for many Americans on how they view Arab Americans, Arab culture and even Arab causes. We need to present ourselves as something other than politically emotional Arab terrorists.Nothing can make a person cry more, than humor! April 11, 2002WGN TV Interview Friday Morning, April 12, 2002View video? THIS POST HAS BEEN READ 4544 TIMES SO FAR. THANK YOU!